Fashion In The Forest: Introducing Yabbly. I've heard people in conversation say that it would be nice to have an app that helps you make better purchasing decisions. I agreed it would be incredibly useful but there just wasn't anything out there...until now. I'd like to introduce you to Yabbly. 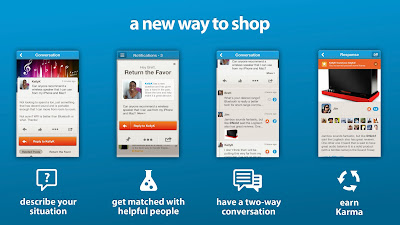 Yabbly is this cool online community of wonderful people who help each other make great purchasing decisions everyday. The Yabbly app was a finalist in SxSW 2013 in the social category! They are also a a top 3 search result in "product reviews" on the iPhone app store. Here's the coolest part. Yabbly is looking for people who are in the know about beauty, fashion, lifestyle, tech and home. If you feel like you're one of those people, feel free to check them out at Yabbly and download our iPhone app. You could help the Yabbly community grow & flourish! The Yabbly philosophy is that the best purchasing decisions are made through dialogue with actual people who have made similar decisions recently. They believe that one of the main frustrations about online shopping today is that averaging a bunch of reviews just doesn't cut it, and you're left buying a product and simply hoping for the best. That's where Yabbly comes in. Got a question? Yabbly guarantees an answer to your question within 24 hours for free! It's like having an online BFF to help you out! There are a lot of amazing features that add to the Yabbly experience. You can create your own "Tens List" of your favorite things you own and love & share it with your followers. You can also have your subscribers add to the Yabbly experience by helping one another make better purchasing decisions everyday through joining our community. Don't forget to ask your own product purchasing questions; that way you can get quality responses that will aid in decision making!